To perform some tasks within your UKCloud for VMware environment, you may need to access vCloud Director through the vCloud API. This guide shows you how to access the vCloud API. Before using the vCloud API, you first need to find your API credentials. Log in to the UKCloud Portal. For more detailed instructions, see the Getting Started Guide for the UKCloud Portal. In the top right corner of the page, click your username and then select API. 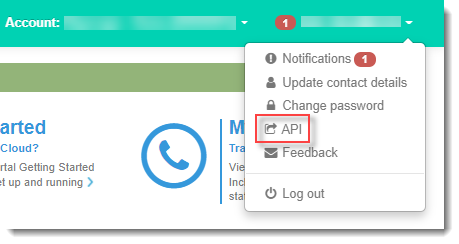 API URL - Use this URL at the beginning of your calls to the vCloud API. This URL will be different depending on the region in which your compute service is located. API Username - The user ID to use to authenticate yourself with the vCloud API. The compute service ID is appended to the end of the username. This is because you may have access to multiple compute services. Username - The API username without the appended compute service ID. Org ID - Use this to uniquely identify the compute service (or vOrg) when using the vCloud API. Password - For authentication with the vCloud API. This password is the same as the one you use to log in to the UKCloud Portal. Make a note of the Org ID, the API URL and your API Username. Now that you have your API credentials, you can start interacting with the vCloud API. First you need to obtain an x-vcloud-authorization token. You must send this token in a header with any subsequent requests to authenticate yourself with the vCloud API. If you find an issue with this article, click Improve this Doc to suggest a change. If you have an idea for how we could improve any of our services, visit UKCloud Ideas. Alternatively, you can contact us at products@ukcloud.com. Back to top © UKCloud Ltd, 2019. All Rights Reserved.